Economical to build, this cozy cottage wastes no space on the inside, while the exterior receives added interest from twin dormers and an arched and gabled entry. Full length front and back porches expand the home's livable space. A cathedral ceiling adds volume to the great room which is overlooked by a balcony and loft/study, while the staircase shields the great room from noise in the U-shaped kitchen. 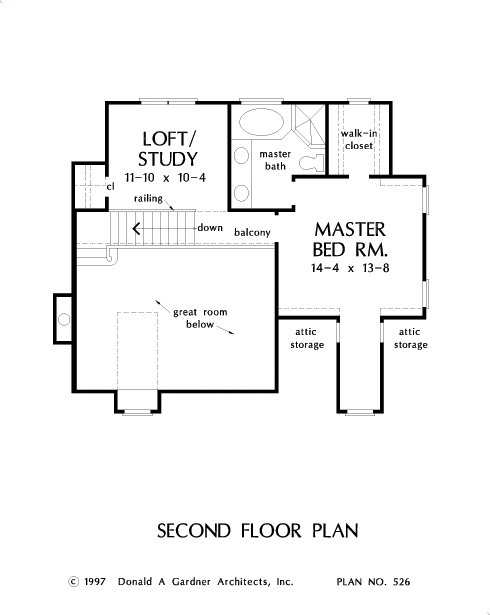 The master suite enjoys privacy, sharing the second floor with the loft/study only. The suite features a dormer alcove, walk-in closet, and private bath. 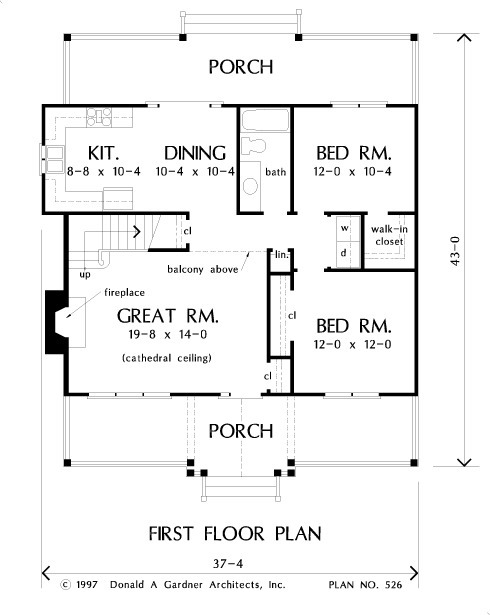 1st Floor: 1055 Sq. 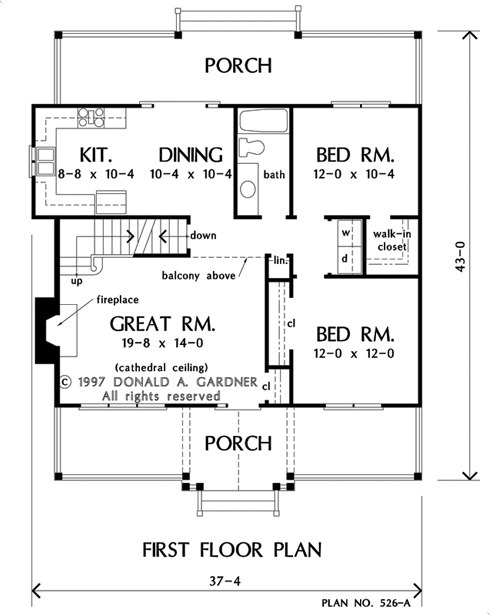 Ft.
House Dimensions: 37' 4" x 43' 0"
Great Room: 19' 8" x 14' 0"
Master Bedroom: 14' 4" x 13' 8"
Dining Room : 10' 4" x 10' 4" x 8' 0"
Great Room (Cathedral): 19' 8" x 14' 0" x 23' 2"
Kitchen : 8' 8" x 10' 4" x 8' 0"
Utility Room : 3' 0" x 5' 4" x 8' 0"
Master Bedroom : 14' 4" x 13' 8" x 8' 0"
Porch - Front : 35' 2" x 7' 0" x 0' 0"
Porch - Rear : 35' 2" x 7' 0" x 0' 0"
Loft / Study : 11' 10" x 10' 4" x 8' 0"
Storage (1st Fl.) : 7' 6" x 3' 4" x 0' 0"